BAGHDAD — Thousands of Iraqi Communist Party members and supporters celebrated the party’s 75th anniversary at a mass rally in People’s Stadium in central Baghdad last Friday. 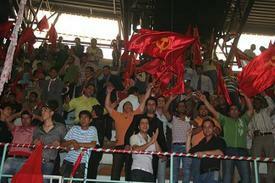 The main sports hall was packed with jubilant people waving red flags, chanting and singing. The event opened with the national anthem which was recited by the Friendship Group. Party leader Hamid Majeed Mousa, a member of the Iraqi Parliament, delivered a speech that saluted the party’s heroic history of struggle and sacrifices for the cause of the people and their country. The speech dealt with the political developments and the recent provincial elections that were marred by violations and irregularities. The program included poetry and songs. Candles of a large anniversary cake were lit by young children, celebrating the party’s founding on March 31, 1934, while white doves were released along with red balloons.